*We are NOT affiliated with Vacation Rental Pros! Please call or email with any special requests. We welcome any rental offers for any length of stay! 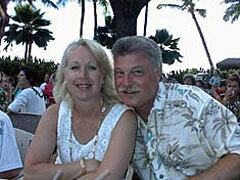 As new owners, we appreciate your business and will do everything we can to make your vacation an enjoyable one! We purchased 5224 Atlantic View in December of 2011 and have made dramatic improvements to this home since then. This is and will be an ongoing effort and so far, we have spent over $55,000. Please feel free to contact us at any time with your opinions or suggestions. We welcome all comments. 1) Completely rebuilt rear oceanfront deck and "Crow's Nest" rooftop deck including stairways leading up and down. Gorgeous views of the ocean now from all decks. 2) 5 new, wall-mounted Flat-Screen TVs - 42" in LR and 32" in all four BRs. 3) Installed secure Comcast High Speed WiFi (NetGear Router). 4) Repaired sliding glass doors and made many screen repairs. 5) Replaced many non-functioning outlets and switches - installed two new wall sconces. Repaired front porch lights and yard light. going downstairs at night. Installed smoke detectors. makes it easier and safer to reach the laundry area and garage at night. 8) Re-seated all 3 toilets with new seal and caulked edges. 9) Moved owner's locked closet to other location for plumbing service access to the water heater in case of emergency. 10) Repaired garage entrance door frame - lubricated overhead door tracks. 12) Refinished entrance hallway floor and painted walls bright color. 13) Painted front entrance door and entire entrance hallway. 14) Installed wall sconces, replaced outlets and switches and other electrical upgrades. 15) Completely cleaned out all kitchen cabinets and touched them up. 16) Repaired laundry garage door frames and entrance doors. an entire truckload of debris. Contracted for ongoing insect and pest control applications. 18) Replaced the old carpeting with brand new area rug in living room. 19) Serviced the Heat/AC Units and pumped out Septic Tank. 20) Purchased the following: Toaster, CoffeeMaker, new set of glasses, new set of utensils, new white sheets, wall decorations, 6 new deck chairs, 4 new beach chairs, other items too numerous to mention. 22) Purchased new additional Pullout Sleeper-Sofa, June 2012. Now sleeps 12 people. We also own two duplexes next to the beach on Long Beach Island in NJ. They are both 2nd from the ocean in the heart of Beach Haven, NJ. Please visit us at www. LBI Beach Rentals .com for lots of pictures and information.